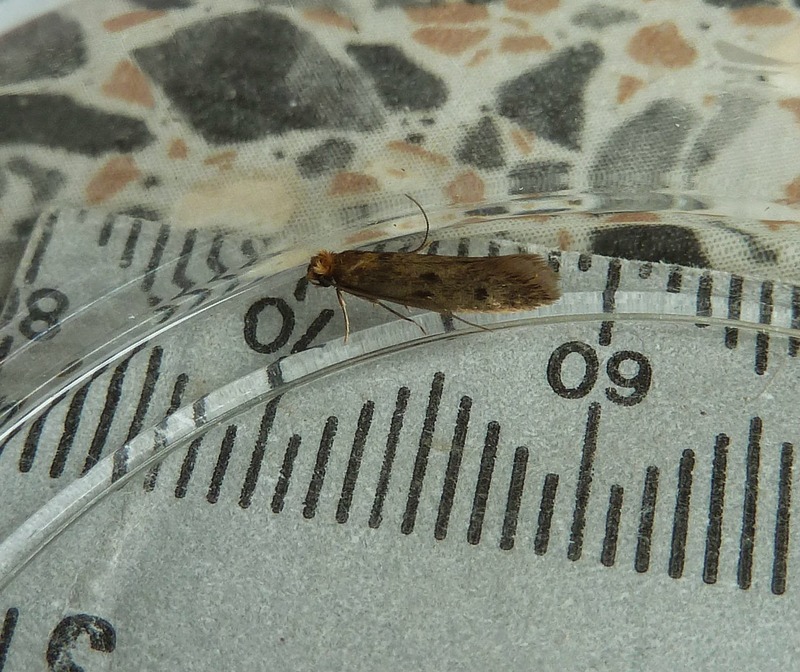 This LBJ was fluttering around in the house for several days on the trot, resisting all of my wife's and my attempts to catch it (I must acquire a net! ), but eventually I enticed it into a pot. The closest match I've found in Sterling and Parsons is Scrobipalpa accuminatella, but it doesn't resemble the illustrations of this species in Chris Manley's new book, or on the UKmoths website. Any suggestions would be welcome. I put two actinic traps out on Monday night and caught several White Ermines and Hebrew Characters, a couple of Brimstones and Brown Silver-lines, and a Water Carpet. Very disappointing. Trapping has been tough at Cwmllwyd for several weeks as well, Chris: you are not alone. I would have logged your mystery moth as Hofmanophilla pseudospretella - shown on page 68 in Chris Manley's book. They are ever so common up here, feeding (I suppose) on the detritus created by our dwindling sheep flock. Size and habits indicate Hoffmanophila - English name Brown House Moth (as in your title). I don't think it's Hofmannophila - the resting posture isn't flat enough, and this species doesn't have a tufty orange head. 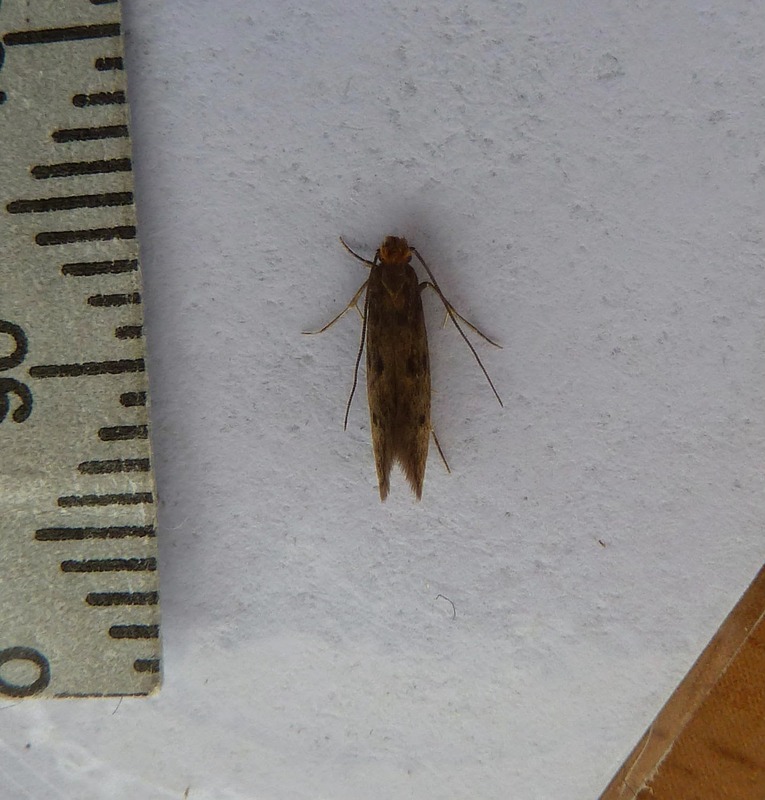 It is one of the clothes moth family, Tineidae. These are tricky. It could be the common Tinea pellionella, but looks a bit big and strongly marked. Ah yes, of course. Sorry Chris - George is spot-on. Thank you Sam & George. My first thought was BHM but as George says, the resting posture didn't look right, and it seemed on the small side (fw length rather less than 7mm). It had an orange head, which points to Tinea pellionella, but case unresolved I guess.